Eerie Beautiful | Be Kind. We're all in this together. The eerie song that played while the Titanic sank: Music from toy pig that comforted children is recorded for the first time after scientists repair it. An eerie song that helped children on a Titanic lifeboat block out the cries of the dying can be heard once again. The song came from a musical toy pig that belonged to Edith Rosenbaum, an American fashion journalist, who was 32 at the time of the tragedy. Rosenbaum and her pig survived the sinking in April 1912, but unfortunately the mechanism that played the music didn’t. Now the National Maritime Museum has fixed the musical toy and made a recording of the song 101 years after the event. ‘It was one of those goosebump moments,’ Rory McEvoy, a curator at the museum, told MailOnline about the tune. Researchers only played the song a few times to prevent further damage to the toy, and made the recording in the hope that the public could identify the tune. In a 1970 interview, Ms Rosenbaum described how she refused to evacuate the Titanic at first, and it was her musical pig that saved her. 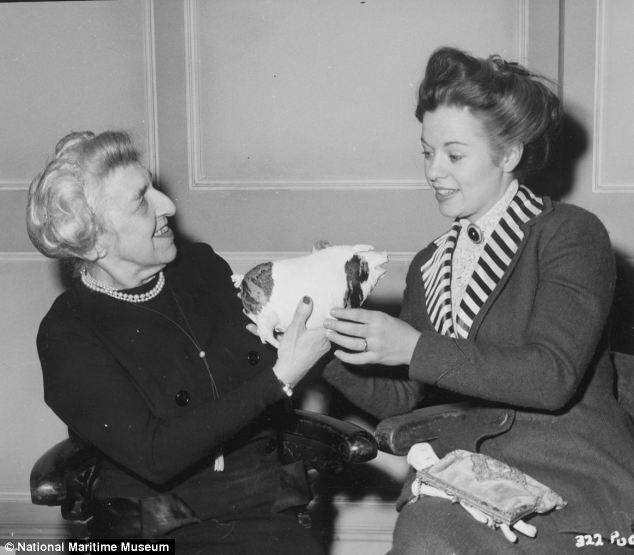 Ms Rosenbaum followed the pig into the lifeboat and, during the seven hours before being rescued, comforted children on board with the tune. 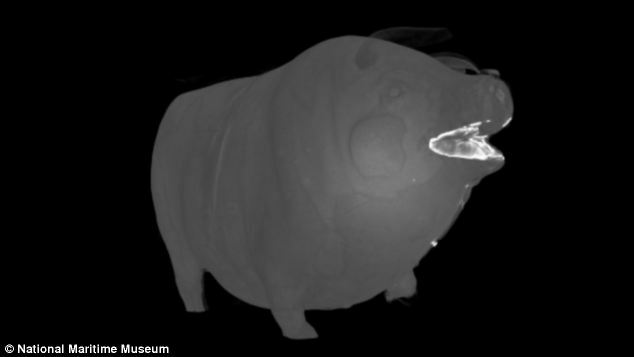 As the pig could not be opened without causing irreparable damage, the team at the National Maritime Museum used high resolution X-ray equipment to examine the internal components. The toy was scanned twice; the first to pick out the details of the main body and a second to obtain good images of the musical movement. 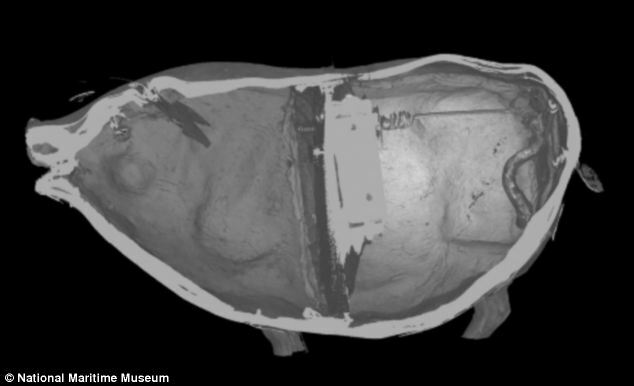 They found that pig’s body was constructed from organic material, wood and papier maché. Mr McEvoy explained that to scan the movement, the lower energy radiation had to be filtered out by placing a small copper sheet in the path of the X-rays before they met the object. The rendered dissection showing the inner surface of the carcass. The pig’s body was constructed from organic material, wood and papier maché. The scan revealed the tail was a knotted piece of vellum that was never connected to the music box. Initially, the team thought the music was spring-driven and activated by pulling the tail. But the scans showed it was actually a hand-powered type of movement. ‘By slicing across the width of the model the cause of a rattling noise was identified as a hairpin, probably used in attempt to reconnect to the music box after the crank had broken away,’ said Mr McEvoy, in his blog. ‘The S-shaped object in the centre appears to be the original crank-handle and tail. ‘Detailed examination of this object shows it to be a skin-covered metal tube, which is an unexpected and very exciting find, perhaps a case for key-hole surgery,’ added Mr McEvoy. The second scan showed a toothed wheel attached to the pin barrel, which was driven by a worm gear on the end of the crank shaft. The comb was marked with a distinctive star logo, which the team are now hoping will help them identify the maker. ‘What has been shown here is only the beginning of the study; these 3-D models provide invaluable information that will assist with our curatorial questions as well as the long-term care and conservation of these extraordinary objects,’ said Mr McEvoy. 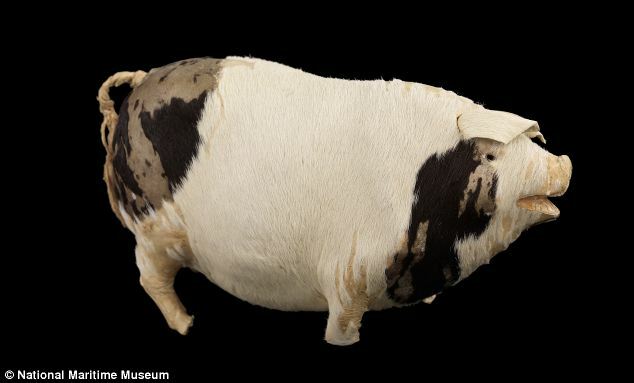 The pig came to the Museum as part of the Lord-MacQuitty collection in 2003. This entry was posted in Uncategorized and tagged inspired music, Titanic. Bookmark the permalink.